“The panoramic view leads me to the present conclusion. Following an 18-year Bull market [1982-2000], and a three year Bear market, we are now committed to what looks like a long-term military obligation in Iraq. In the grand scheme of things, I suspect we are in for a harder long-term slog than the mere 3 year Bear market suggests. • Average secular bull market lasted 21.2 years and produced a total return of 17.2% in nominal terms and 15.9% in real terms. The market’s P/E more or less doubled, from 10.1 at the start to 20.5 at the end. • Average secular bear market lasted 14.5 years and had a nominal total return of +1.0% and a real return of –2.3%. The market’s P/E compressed by an average of 9 points, from 20.5 at the start to 11.3 at the end. Here we are, a few weeks away from the start of the 14th year of the secular Bear market that began March 2000. The question on more than a few peoples’ minds has been whether or not it is reaching its end. 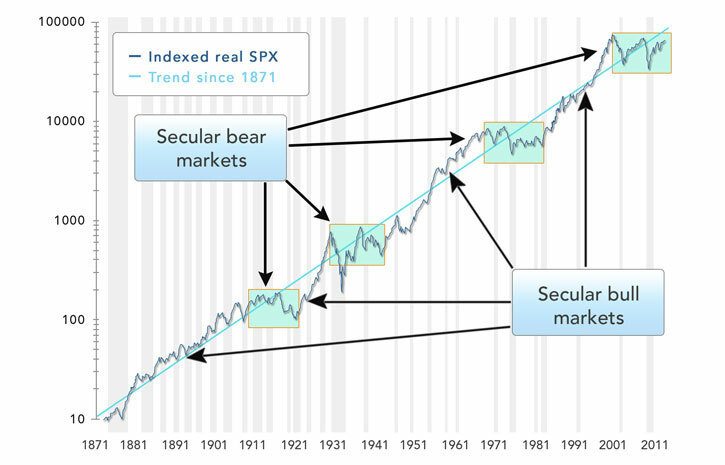 “A of Secular Bear Markets is a long term cycle which typically begins after a long term bull market peak and crash. It is primarily characterized by strong, even excessive rallies and selloffs, all occurring within a broad trading range. Despite the strong rallies, markets often appear to be unchanged a decade or so into secular bears. The psychology is one of compressing Price to Earnings multiples, as investors become increasingly unwilling to pay the same price for each dollar of earnings. There is often a general malaise to the broader society, sometimes encompassing political scandals and/or war. -Are markets still rangebound? Have we made new highs in various indices? -Are P/E multiples still contracting? -Are financial news media ratings still falling? -Is Main Street still disinterested in equities? Some of the answers to these questions are purely quantitative, and do not require any human judgment. A few of these do require a squishier answer. After 36 months or so of capital outflows from equity funds, we should not rush to judgement after the first month of inflows. And there is a major caveat to this: The Fed’s extraordinary ZIRP/QE intervention creates an impression of inorganic gains. Without the unprecedented FOMC actions, I am unsure markets would be anywhere near current levels. Regardless of your answer to our broad question, there is one thing that I believe to be clear: We are much closer to the end of this secular cycle than to the beginning. Many optimists — most notably, famed technician Ralph Acampora — believe the secular bear market has ended. Even skeptics have to agree that we are more likely in the 7th or 8th inning than earlier stages of the game. Only the “America is Japan” crowd thinks we are in the 3rd or 4th inning. The key question for investors: Are you prepared to make changes to your portfolios? Source: Haver, Factset, Robert Shiller, FMRCo. Monthly Data, since 1871. Is the secular bear market ending for stocks?